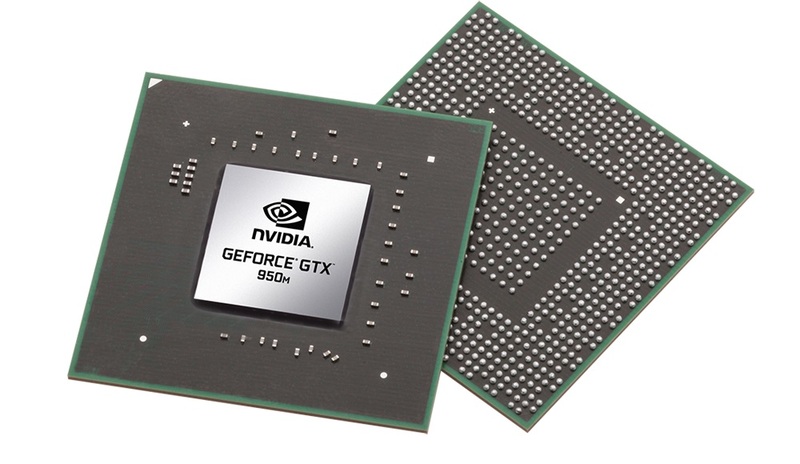 The NVIDIA GeForce GTX 950M is an (upper) mid-range, DirectX 11-compatible graphics card for laptops unveiled in March 2015. It is based on Nvidia's Maxwell architecture (GM107 chip) and manufactured in 28 nm. The GTX 950M offers 640 shader units clocked at 914 MHz (+ Boost) as well as fast GDDR5 memory (128 bit, 5000 MHz effective, 80 GB/s). Compared to the previous and technically very similar GTX 850M, the GTX 950M is clocked slightly higher. A detailed performance comparison of the GTX 950M with GDDR5 and DDR3 can be found here. Some GTX 950M may be equipped with cheaper 900 - 1000 MHz DDR3 memory (1800 - 2000 MHz effective, 28.8 - 32 GB/s), which leads to a 10 - 20 percent lower performance despite the slightly higher core clock of 993 MHz. Although the GTX 950M has the same memory bandwidth as the previous GTX 850M, its higher core clock leads to a slightly better performance. Overall, the 950M (GDDR5 version) is about 15 percent slower than the GTX 960M and just slightly behind the old GTX 860M. Many games of 2014/2015 can be played fluently in FullHD resolution and high detail settings. However, very demanding games such as Assassin's Creed Unity will require lower resolutions and/or details. The power consumption of the GeForce GTX 950M should be similar to (or slightly above) the previous GTX 850M at about 50 watts. Therefore, the GPU is best suited for 15-inch laptops or larger. The 900M series also supports Optimus to automatically switch between an integrated graphics card and the Nvidia GPU.